Even though I’m a member of the Exhibits Department, I think it’s fair to say that research is the backbone of our Museum. Our research staff has been collecting and studying plants and animals for decades. But you may not know that Exhibitionists do their own research as well. The subject? Well, not to put too fine a point on it: it’s you. Here are a few of our research subjects in their natural habitat. We don’t want to startle them, or they might bolt. We often use evaluation multiple times during the development of an exhibit. We might want feedback at the beginning, to see if our ideas are sound. We might want it in the middle, to address a particular quandary we’re having. And after the exhibit goes onto the floor, the only way to know if it works is to see if you, the visitors, walk away more interested or more informed than you were before you came. Usually our approach is straightforward: we ask. Surveys are an invaluable tool for exhibit evaluation. If ever you see a poor soul with a clipboard and a smile standing in an exhibit, trying to catch your eye, we probably want to ask you a question or twelve about the exhibit you just saw. Did you like it? What did you learn? Could you rate your satisfaction on a scale of one to ten? Surveys are like tests you forgot to study for, but we hope they’re not as nightmarish. 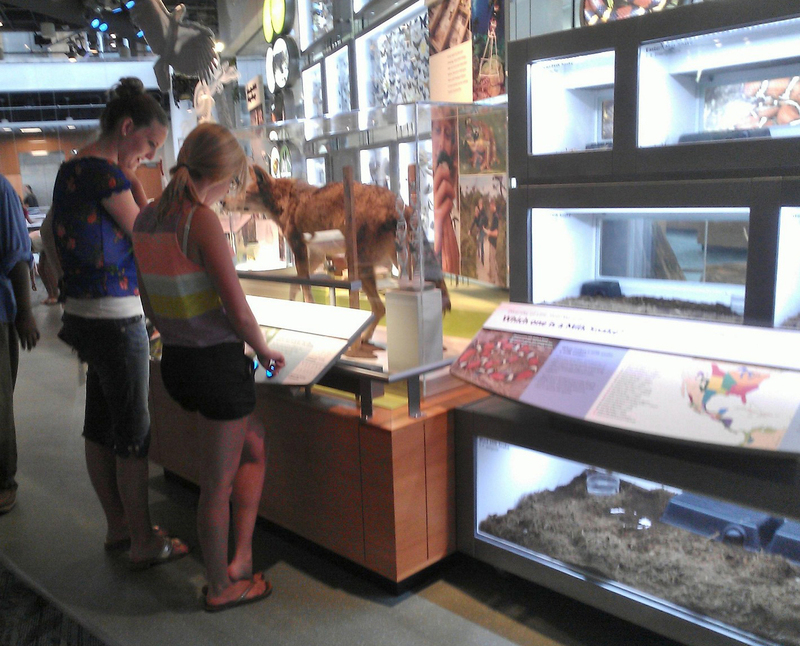 Surveys are a great way for us to determine if the exhibit needs tweaking, but sometimes they feel like a pop quiz. Several years ago, we decided to evaluate our “Terror of the South” exhibit. We had heard from the paleontologists that visitors were confused about what kind of dinosaur was on display. We decided to ask people as they exited the exhibit: Do you remember the name of the big dinosaur skeleton? What did you just call me? “Tyrannosaur” is considered a slur to some theropods, sir. 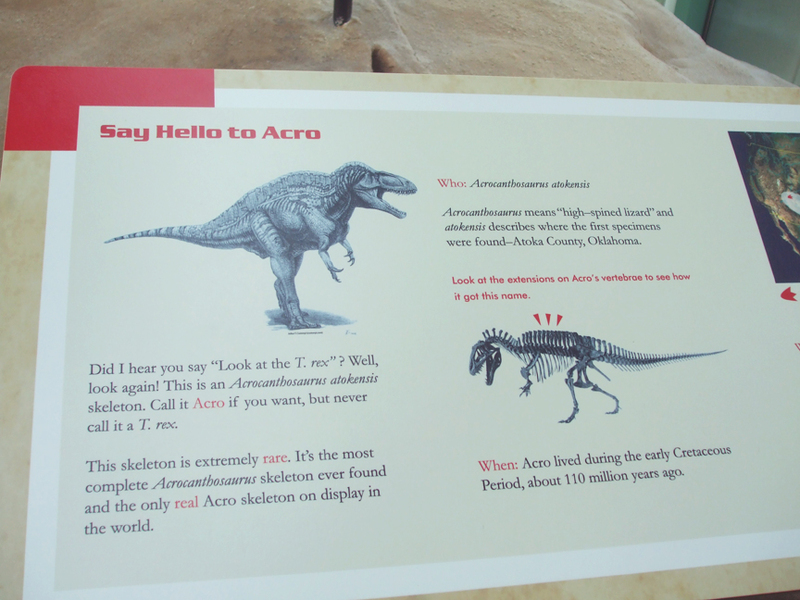 “Terror of the South” features a very rare, important specimen of Acrocanthosaurus (“Acro” for short). It’s the only real Acro skeleton on display in the world. 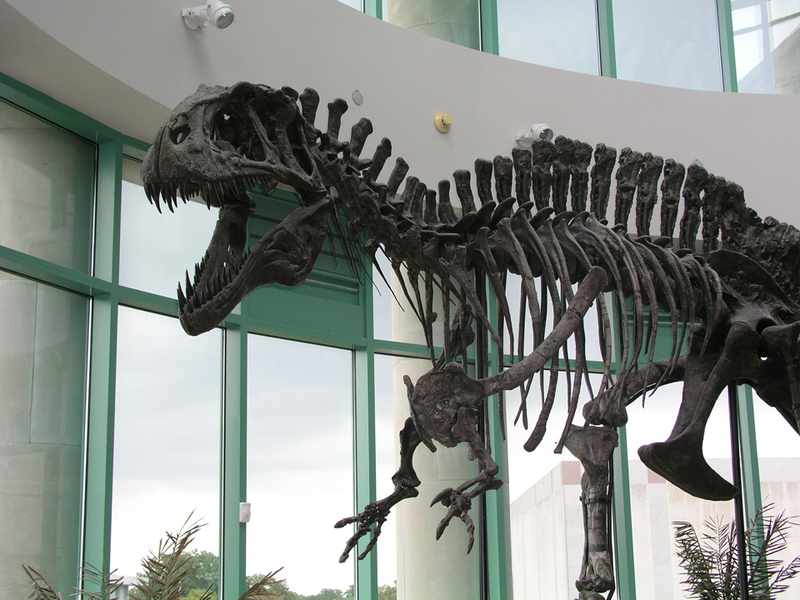 But with our surveys, we found that 80% of the visitors who saw the exhibit thought they had seen a common T. rex. Ack! We had something much more rare than a T. rex, but our visitors didn’t know it. After the surveys, we engaged in some old-fashioned spying. We knew that the labels in the exhibit identified the skeleton, but apparently they weren’t clear. Or maybe visitors just weren’t reading them? Maybe the labels were too long, too boring, or poorly placed? We got our stopwatches and sat in the gallery, meticulously mapping out where visitors stood, how long they stood there, and what they did or said to each other. We saw that some labels received zero attention, even though they were right in the middle of the gallery. And we overheard school children relaying misinformation to each other. Often one kid would shout “Look at the T. rex!! !” when first entering the gallery, and others would pass it on. Misinformation is like the flu—one sneeze, and everyone’s infected. Sometimes a label needs a little snark to be effective. Experiments like these are just some of the ways that we stalk study our visitors. The Museum was recently host to the Visitor Studies Association’s annual conference, where we learned even more about how to track our elusive prey. So if you ever get the feeling, while standing at an exhibit, that someone might be watching you…. well, don’t worry. Unlike other scientists who study mammals, we hardly ever trap and tag our subjects. ← Ask an Exhibitionist #1: What’s the fake water?